Today, more than a half-century after Gustav Frištenský died; his name still symbolizes strength, fairness, and a well balanced lifestyle. Not only in his native Czech land and throughout Europe, but also as far away as South and North America the name still enjoys celebrity status. What follows is a glimpse into Gustav's early years. Following the revolutionary period of 1848 in the Habsburg monarchy, which Bohemia was a part of, only two members of the Fristensky family remained. They were two brothers; Vaclav (1808-1884) who never married, and Frantisek (1820-1884) who married Marie Nollova and fathered six sons and three daughters, thus continuing the Fristensky lineage. One of the sons was Alois, Gustav's father. Gustav was born to Alois and Kateřina Frištenský on May 7, 1879 in Kamhajek near Kolin, Bohemia, which became Czechoslovakia in 1918. Father Alois was the third oldest of 9 children and one of 6 boys, four of whom emigrated to America between 1872 and 1891. 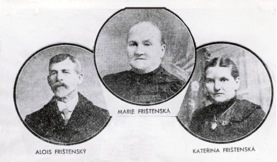 The Fristensky's had 7 children (Anna, 1877; Gustav, 1879; Karel, 1881; Marie, 1882; Josef, 1885; František, 1885; and Pavla, 1889). Gustav experienced a hard and sometimes difficult childhood. He became quite ill at the age of one, as typically happened to infants in those days. He was cared for by the village's herbalist who is given credit for saving his young life. He quickly recovered, and rapidly gained size and strength. As the oldest son he was expected to help his parents run the family farm, which his father had taken over from his grandfather. At times he had to skip school to help out during the harvesting season, but the schoolmaster understood. From his early childhood he was blessed with a strong physique, and by the age of six he was able to lead a team of oxen without difficulty. By age twelve he was tossing 100 plus pound bags of grain into the granary and was able to restrain horse's legs with his bare hands while they were shod. It was at about this point in time that he began to recognize and cultivate his natural strength. In order to make his workouts more rigorous, Gustav began to fashion simple dumbbells and kettle bells from heavy granite and metal rods. The stronger the young Gustav (called Gusta) became, the more frequently he missed school in order to help out on his father's farm. When he was 14, the family begun to plan for his future, as the farm work could now also be shared by his younger brother Karel, the second son of the family. In the fall of 1893 it was decided by his parents, without Gustav's consent, that he would apprentice as a blacksmith, which at that time, was one of the few prestigious trades that could also allow one to make a decent living. So he went to Kolin, to master blacksmith Jech. One of Gustav's responsibilities was to light the fire in the shop, a chore that had to be done very early every morning. They worked late into the evening hours and sometimes on weekends too. Food was often scarce, but young Gustav worked diligently and learned quickly. He was praised often by his boss. Older apprentice Vaclav didn't like the fact that Gustav was becoming a leader among the three apprentices due to his strength and eagerness to excel. As a practical joke at the end of the shift one day they placed a glowing horseshoe into a pile of old horseshoes and ordered Gustav to put them away. Unsuspecting, he grabbed the still glowing horseshoe and burned his palm to the bone. The pain was terrible, both physically and emotionally. 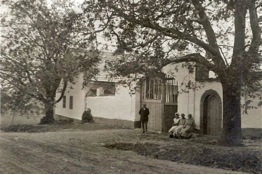 Complicated home healing of his damaged hand took nearly 3 months, after which Gustav could not get himself to return to the smithy. Again, the family decided without Gustav's consent that he would enter into another apprenticeship, this time with a master butcher named Kratochvil, again in the town of Kolin. This was another prestigious trade, requiring as much hard work as had the blacksmith's trade. In addition to good wages it also offered the bonus of providing extra food rations. During this time the young Gustav was becoming stronger and stronger, helped by carrying large loads of animal parts on his shoulders and by continuing to train vigorously with his self-made granite barbells. In addition to his daily apprenticeship work at the butcher shop Gustav attended obligatory evening trade school. He was a very good student, and for his school achievements the teachers' consortium presented him with a book that deeply touched his life. He loved to read, and this book contained many well known stories and poems from Bohemian history. It also included many pictures portraying strong men from ancient fairytales, one of whom was the strong Bivoj who became one of Gustav's idols. The book contained an inscription: As an acknowledgement to Gustav Fristensky, student of the 1.B class for his outstanding school achievements, in Kolin April 15, 1896. At the age of 18 Gustav completed his butcher apprentice and became a master butcher. He found work in the nearby village of Kourim at the butcher shop of Mister Holecek. During this time he witnessed another performance by a traveling strongman named James Deleware. This man was from America and made a stop in Kourim where Gustav was employed. Deleware's performance was more professional than the one he had witnessed in Kolin a few years earlier. After demonstrating his strength by lifting heavy barbells and several large grinding stones Deleware called for challengers from the audience. A local brew master didn't last too long, and no one else would stand up against the crafty American. The next morning Deleware and his entourage (his Bohemian wife and two children) left the village. He had no idea that he would meet Gustav, who was already vigorously training and lifting weights, in an official wrestling bout few years later in Brno. The outcome of this match was not favorable for Deleware. In his memoires Gustav later stated, "James Deleware was the only wrestler in the world that I was somewhat fearful of even though I defeated him every time we met after I became a professional wrestler. But at that time in Kourim I was just 18 years old, and I couldn't guess that in the near future I would become a wrestler." It was a common practice of families then to send the oldest son away from home to gain more trade and practical experience. Once more the family council debated and decided the fate of the by then almost 20 year old Gustav. They decided that he needed to gain some "world experience" by moving away from home and learning to take care of himself. At this time a logical destination for career-minded young people was Vienna, Austria. So this was the destination Gustav's family had determined for their son. He packed his few belongings in a small suitcase, and his father drove him to the train station in Kolin where he began his journey with words of wisdom from his grand mother Marie ringing in his ears. "Let God, my son, be your safeguard from all harm on your voyages," and with a raised finger pointing to his face she continued "…and, I am urging you, my son, guard yourself against girls… they may cause you harm." At the train station they ran into Gustav's former teacher, Mr. Stuchlik, who asked where Gustav was heading. "To Vienna," proudly replied Gustav's father. "We have several contacts which can provide him with a good position and place to stay," added the elderly Fristensky. Then Mr. Stuchlik whispered to Gustav, "You are traveling through Brno. Stop to see my brother-in-law who is a butcher there. He could give you some advice," and he put an address in Gustav's hand. Father Fristensky didn't like it a bit, thinking to himself, "…Vienna is Vienna, the center of the world. He will learn German….and when he joins the Austrian army he can become an officer right away, instead of sweeping the barracks and brushing the dirty floors." But he didn't want to reject the former teacher, so he said nothing. With a brief goodbye Gustav jumped aboard the train which carried him to the next stop on his journey… which, to his surprise, was not Vienna!